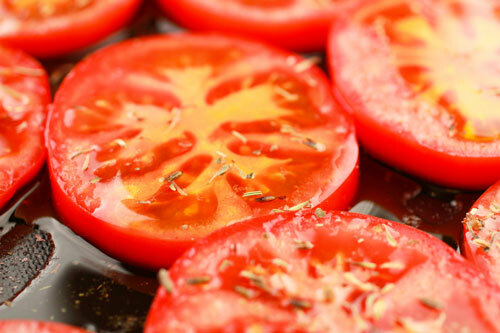 Wash the tomatoes and cut slices of approximately 1 inch each. Brush the Silpat® Entremet with extra virgin olive oil. 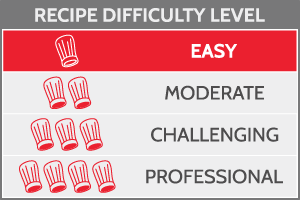 Arrange the sliced tomato right on top the olive oil on the Silpat® Entremet. 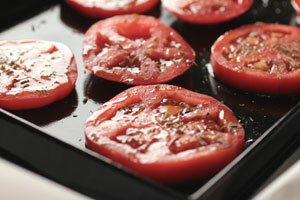 Season the tomatoes with salt, sprinkle the Provence herbs and brush more extra virgin olive oil on top of each tomato slice. Broil at 400 F for about 15 minutes, rotating the tray in the oven half way through cooking. When ready, serve the tomatoes arrange properly on a nice white plate, finishing with finely chopped garlic, a pinch of maldon salt, and the fresh parsley and basil on top. It is very important to chop the fresh parsley and fresh basil at the last minute to avoid oxidization. Use sharp knife and cut julienne style to ensure your fresh herbs will release all the flavor and aroma.